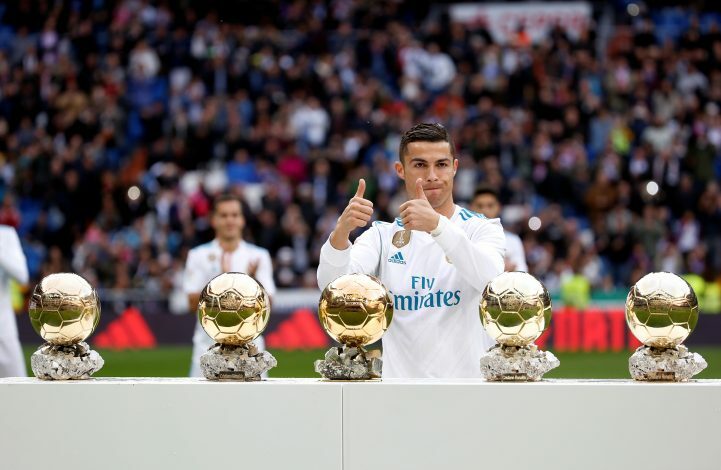 In a historic day at Santiago Bernabeu, Cristiano Ronaldo showed off his fifth Ballon d’Or before the start of the match against Sevilla. The 32-year-old was awarded the coveted award in Paris two nights ago to mark an incredible year in which he helped Real Madrid win both La Liga and the Champions League. With this fifth Ballon d’Or award, Ronaldo has come level with Barcelona’s Lionel Messi, who won his fifth in 2015. On Saturday, Ronaldo showed off his award to the Bernabeu crowd on his own. However, back when Messi won the same award for the fifth time, he showed it off to the Camp Nou in January 2016, with his fellow teammates by his side. Leo Messi’s fans have made a picture comparing the ways that both the players showed off their individual awards. The day Messi did so, Barcelona got the better of Athletic Bilbao in a 6-0 win, while Real Madrid defeated Sevilla 5-0, courtesy of a brace from Ronaldo, who had been struggling to score in the league before this match. Surprisingly this season, Real have continuously shown dismal performances over the weeks, but they seemed to be at their very best against Sevilla. The Galacticos are currently placed third in the league table, behind leaders Barcelona, followed by Valencia.